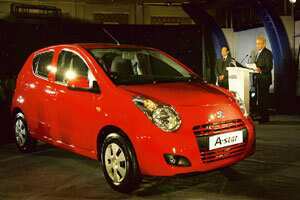 New Delhi: India’s top car maker, Maruti Suzuki India Ltd, expects to begin shipping its A-star small car to Japan’s Nissan Motor Co. by March for sale in Europe, the Indian company’s managing director said. “I think we will start the first shipment to Europe in February or March," Maruti’s managing director, Shinzo Nakanishi, told reporters on Wednesday. “About the pricing and volume we are still negotiating." The Business Standard newspaper reported earlier this month a slowdown in Europe had forced Nissan to cut its sourcing from Maruti to just 10,000 cars. Automobile sales in India have fallen this year as buyers were put off by a credit crunch, high borrowing costs and a slowing economy, forcing some companies such as leading vehicle maker Tata Motors Ltd to cut output. Nakanishi said he hoped Maruti, whose sales fell 3% between April and November, would not have to reduce production. Car makers, including Maruti, had lowered prices after a 4% reduction in the central value-added tax by the government earlier this month. The authorities had also slashed interest rates, cut prices of petrol and diesel and announced an economic stimulus package to shore up the economy against a global slowdown. Nakanishi said the price cuts would boost sales over the next three months and the company may not have to cut production to control a possible inventory build up. “I hope not," he said, but cautioned the company would have to adjust production if sales failed to pick up and inventories mounted. “I strongly believe that sometime next year we will get a better feedback from the market," he said, expecting sales to be back in the positive territory. Shares in Maruti, whose market value has nearly halved to about $3 billion (Rs14,700 crore) this year, lost 2.08% on Wednesday to close at Rs502.30 on the Bombay Stock Exchange. In comparison the exchange’s benchmark index, Sensex, closed lower by 1.22% at 9,568.72.